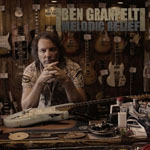 Share the post "Album review: BEN GRANFELT – Melodic Relief"
Ben Granfelt used to partner Andy Powell in Wishbone Ash and it’s no surprise that fellow Finn (and former bandmate in Gringos Locos) Muddy Manninen and Powell contribute to one track, ‘New 7’. It may come as a surprise, though, that this is Granfelt’s eleventh solo album, now getting a re-promotion in the UK. It might be timely, as the album doesn’t seem to have commanded much attention (or reviews) when first released. Right from the opener, this is a guitar instrumental album with purpose. ‘El Gringo’s Revenge’ rattles along and sets the very high standard maintained throughout. Granfelt never over-eggs. He evidently has the chops but unnecessary histrionics never hijack a good tune. A seasoned pro having a damn good blow. There is even a hint of Satch-esque melody here and there whilst that other great instrumental troupe The Hellecasters are evoked on tracks like ‘GTR Tech’ and indeed the Ash-collaboration ‘New 7′. The bluesy ballad ‘Still Waiting’ brings to mind mid-seventies period Jeff Beck (as does the fusion-y ‘Because We Still Can’) and ‘GMT’ has a slight ‘While My Guitar Gently Weeps’ feel in places and is the mandatory slow-burn, pot-boiler. On this album, apart from his Wishbone Ash guests, Granfelt is joined by long-time colleagues Ako Kiiski on bass (Guitar Slingers) and Twist Twist Erkinharju on drums (from Granfelt’s other ongoing band interest Los Bastardos Finlandeeses). This entry was posted in ALBUM REVIEWS, ALBUM REVIEWS (Mobile), All Posts and tagged album, Andy Powell, Ben Granfelt, Finland, Finnish, guitar, guitarist, instrumental, Los Bastardos Finlandeeses, melodic Rewlief, Muddy Manninen, review, rock, Wishbone Ash. Bookmark the permalink.